A quick guide to living on the water for less. I visited Baltimore last weekend and went for an early walk through Fell’s Point and Canton. Both neighborhoods are on the water and have a great maritime history. Just a week before, the city celebrated the 200th anniversary of the Star-Spangled Banner, written by Francis Scott Key in 1814 during the British bombardment of Fort McHenry just across Baltimore’s Inner Harbor. The two neighborhoods are part of a vibrant diverse waterfront community thriving with tourism, small businesses, local restaurants, coffee shops, and pubs. I walked along the waterfront promenade towards Canton, checking out one of the largest marinas in the area. The promenade was great for a walk, right on the water with plenty to see, smell and hear. As I was turning around to head back towards Fell’s Point, a couple said hello to me from the back of their houseboat. I stopped to chat them up because I’ve always been fascinated with all of the different ways that one could live on the water: houseboats, large sail boats, cabin cruisers. I asked if they lived aboard and we started up a conversation about life in the harbor. We chatted long enough for me to ascertain that they loved living there. They had a couple of bikes and a kayak stowed on the front deck. It sort of looked like an ideal setup for a not-so-young couple who wanted to live in one of the most vibrant parts of the city with a 360° waterfront view. What I was very surprised to learn, as I shamelessly asked them about living expenses on a boat, was that they paid just $2000 a year to rent a slip for their floating home, including water and power hookups! Think about that for a second, that’s about $170, including utilities, per month, and you pay no property taxes. I know people whose cable bills are higher than that. I thanked them for their wisdom and continued on my walk, full of ideas. I found the monthly slip lease number hard to believe as most of the slips were over 30 feet long and they were in what I would consider a prime spot. I called the Marina and, in fact, the numbers were correct. The marina office did mention that they frowned on full-time residents. As it turned out, a lot of the folks who live on the water only do so five or six months a year, then head for warmer climates in the winter. I imagine that houseboat living becomes a lot less appealing when ice and snow enter the picture. Others travel frequently and then rent their houseboats out on sites like airbnb.com or sleepafloat.com. Based on my quick back of the napkin calculations, just 10 – 12 rental nights per year and you have most of your dock fees covered. I think this is a fantastic lifestyle option for singles, young couples and empty-nesters who don’t want to be burdened with a mortgage and property taxes. It’s an interesting option even for a small family that would like a summer getaway that could cover the expenses with rentals. In cities like San Francisco,Sausalito and Seattle, floating homes have already priced themselves out of the market but I think there are still many opportunities in warmer climates. High-speed wireless options and endless advances in mobile technology make boats ideal for digital nomads and those who like to work with a view. As most harbors are popular tourist destinations, there are many unique options to explore this lifestyle, maybe even start a small business afloat. 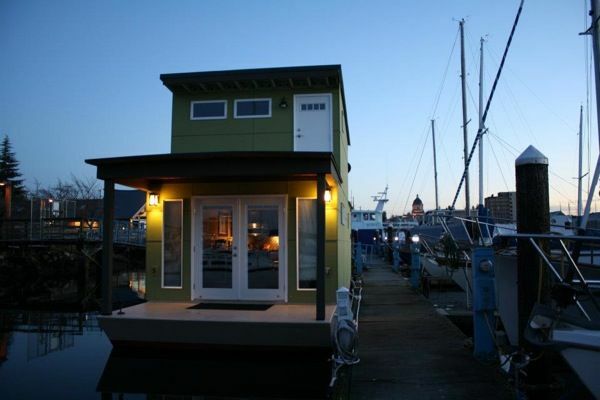 Check out a few of these cool floating home resources. AirBnb.com has lots of interesting floating rentals check a few of these out. Want to stay on a beautiful floating home in downtown Amsterdam $150 a night, no problem. Check out some of these options. This blog post contains some interesting floating home examples and lots of links. Inspiration Green has some unique examples of different types of floating homes. Great stories and living aboard tips from a guy who’s been living on the boat since 1999. If you want to talk yourself out of living on a boat. You want to be inspired about boats, and life in general.